Open to the Public, this Earth Day Event and Film Festival will allow attendees to view the informative and entertaining documentaries: "Trashed" at 10:00am, "The Cove", at 12:00pm and "Food, Inc" at 2:00pm. Guests will also have the opportunity to tour the HGTV Dream Home 2013 - the first Platinum LEED certified home in the HGTV home series. Announcing the 4th Annual Indigo Park Earth Day Celebration. This year, Dyal Compass, a leader in the field of environmentally friendly property development, will be showing the critically acclaimed documentaries: "Trashed", "The Cove" and "Food, Inc". Visitors are encouraged to view the films and walk the gorgeous waterfront park within Indigo Park. Also, throughout the day tours will be offered of the HGTV Dream Home 2013. This home is one of the premier homes in this new and eco-friendly development. 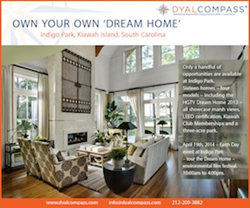 Indigo Park is a luxury development within the heart of exclusive Kiawah Island. The homes of Indigo Park boast beautiful water views and are made of the most innovated materials on the market today. http://www.dyalcompass.com/properties.php?id=HGTV%20Dream%20House Indigo Park homes allow you to enjoy all Kiawah has to offer because they are low maintenance and save lots of money on utility bills. Dyal Compass, LLC is a real estate development company who, in collaboration with a world-class team of architects and builders, creates high-end luxury properties with a focus on LEED and Passive Home certified accreditation. Dyal Compass takes pride in its approach to developing responsible living practices with a conscience. Its goal is to design, develop and deliver properties for those clients who value green building practices with environmental awareness and conservation. In previous years Dyal Compass has celebrated Earth Day with Tesla test drives and a panel discussion on sustainability across many industries - from automotive to the law, to investments to publishing. Kiawah Island is the perfect place to spend your weekend - there are miles of beaches to walk, bike trails to ride and restaurants to dine. Earth Day weekend at Indigo Park in Kiawah Island is a wonderful family treat! Please contact Dyal Compass for more information.